This annual music festival attracts around 200,000 people with over 200 artists performing at 7 venues across the centre of Bourges over the 5-day event. It’s a celebration of music spanning diverse genres, established artists and up-and-coming musicians. The headliners this year include Biffy Clyro and the Klaxons but much of the fun is in discovering new music, experiencing the buzz that flows through the streets, bars and restaurants, and being part of this vibrant event that transforms the whole city. Celeb spot and discover the latest film talent at Cannes. The atmosphere is electric as this glamorous location takes on even more sparkle hosting movie stars, Hollywood producers and of course hordes of paparazzi! The best chance of spotting a famous face is usually in the opening few days. 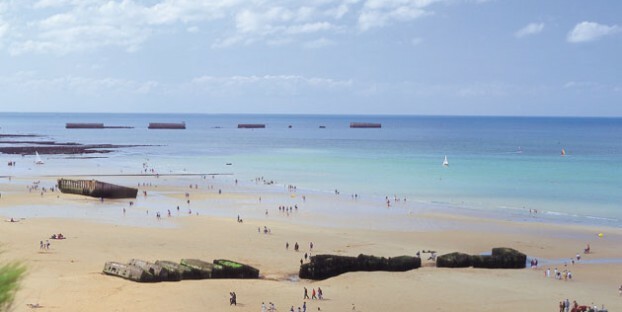 This is a season of events commemorating the 70th anniversary of the D-Day landings. The programme begins on 5 June with a concert that culminates in fireworks being launched simultaneously from 24 locations along the landing beaches. Events continue with reconstructions, parachute displays, parades and exhibitions. It’s a great way to introduce younger generations to the heroism and bravery of those who fought in these critical battles during the Second World War. A must for fans of fine French wine, this festival centers on the largest town square in Europe right on the banks of the Garonne River. More than 300,000 people flock to attend the four-day event that includes the chance to sample the wines of Bordeaux and the Gironde, learn wine tasting techniques from the experts, meet local producers, visit vineyards and attend gastronomic events celebrating the food and wine of the region. Every year the Tour de France remains the most defining event in France and garners a massive audience worldwide! The Tour de France returns in 2014 with a route of 21 stages totaling 3,656km. The race starts in Yorkshire in the UK and skirts down the eastern edge of France before crossing the south coast and dipping into Spain. The traditional finale on the Champs-Elysees in Paris takes place on Sunday 27th July. The Festival d’Avignon annual arts festival is held principally in the courtyard of the Popes’ Palace in Avignon. During the festival the whole city is permeated with music, dance, theatre and performance art. It’s the largest show of its kind in Europe and features professional and amateur performers from all over the world participating in street art and theatre productions across the city. This year the guest artists are renowned choreographer Boris Charmatz and British actor and director Simon McBurney. The famous Le Mans 24 hour road race has been taking place since 1923. The gruelling 24 hour drive starts at 3pm with 56 cars setting off on the track. Teams from all over the world compete with the Porsche, Toyota and Audi the three main manufacturers in contention. An exhilarating event with an incredible atmosphere and a must for motorsports fans, the “Glastonbury of motor racing” comes very highly recommended on TripAdvisor, even for guided tours of the track when it’s not race time. Festival des Vielles Charrues is the biggest music festival in France, based at a site in Carhaix in Brittany. This year huge names in pop including Elton John, Arctic Monkeys, Franz Ferdinand, 30 seconds to Mars and The Black Keys will be performing as well as a wealth of lesser known artists from all over the world. Camping is available on the 30 hecatare site, or choose a hotel or gite in Carhaix to stay close to the action in comfort. Ten days of fun and festivities celebrating the Celtic culture, this huge event welcomes performers and visitors from all over the world. Over 50,000 spectators come to see the parade on the opening Sunday. There are 120 stage shows, as well as workshops, lectures, concerts and historical reconstructions scheduled to take place across the city of Lorient, as well as daily parades, markets and street entertainment. For further details visit the Festival InterCeltique official website. This Breton festival takes place every August in Concarneau in celebration of the traditional local culture. Events include costume parades, dancing, ‘gouren’ wrestling, ‘palets’ boules tounaments and a pageant with the year’s newly crowned ‘Miss Filets Bleus’. Named after the blue sardine fishing nets that used to form the main industry of the area, this festival has been going for over a hundred years and has become one of the best festivals of the Breton heritage. Have you got a favourite event in France you’re looking forward to this year? Why not tell us about it in the comment box below – we’d love to hear from you!